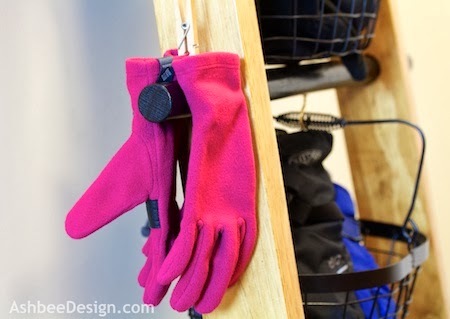 If you have been following my blog since the beginning (and very, very few of you have) you'll know that one of the first design challenges I presented as needing a solution in our home is the Mitten Dilemma. We live in the snowy northeast and the mess of winter outer-clothes is an annual nusiance. And on snowy winters, it is a problem for weeks and even months on end. I blogged about this issue back in my very first month of blogging in January of 2011. It has taken me only three years to finally take the time to solve this issue. 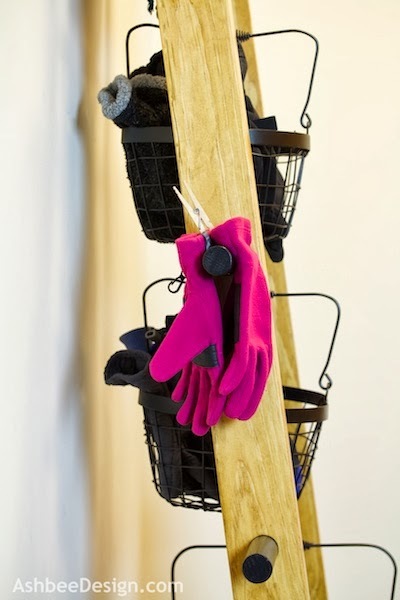 Yesterday I finished building our new mitten and hat rack and today it got photographed! Here, in the corner of our family room and main entry is our version of a mudroom in a house with no mudroom. 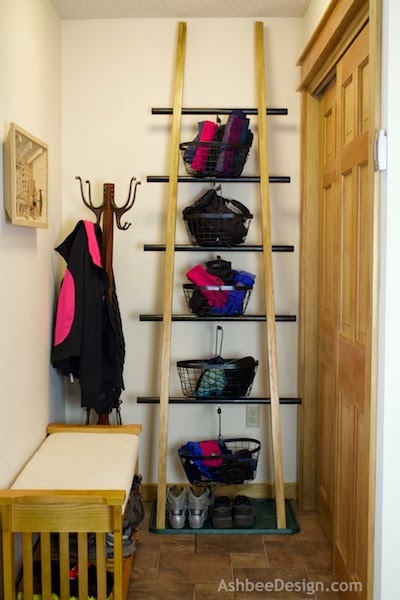 Into the end of it I have added a ladder with baskets for holding winter gear. 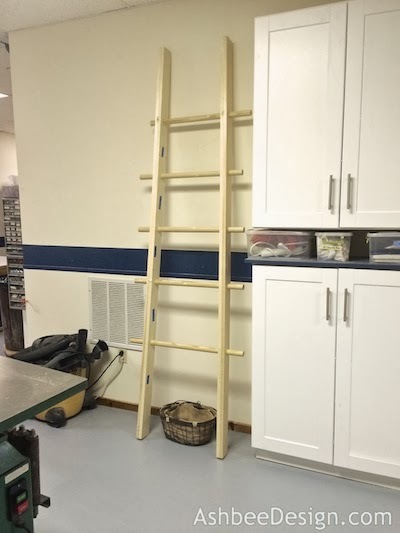 The ladder is a leaning ladder and it was sized to fit five wire baskets I purchased at the Home Store. 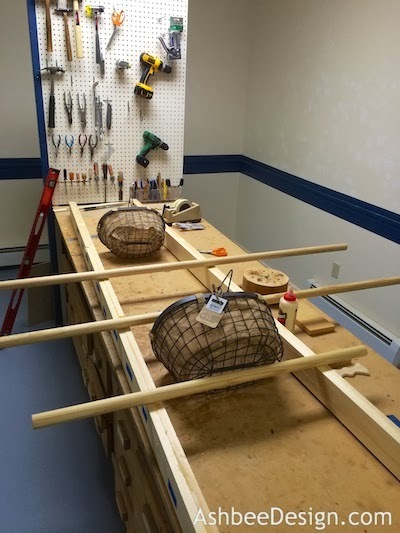 I purchased five baskets because that was all that would fit in the space and I designed the ladder proportions for these specific baskets. Is it enough storage? No, but it is enough storage for our most used items, and it keeps them in a place that is easy to find items, and easy to return them to. David and I have split the baskets. There is one for his hats, and one for my hats. There is one for his mittens and gloves, and one for my mittens and gloves. And, at the top, is one for scarves and neck turtles. We share that one. These baskets came with burlap fabric liners which I removed. Although they looked good, part of making these functional is being able to see at a glance what is in the basket. I can quickly see my hot pink turtle is in the top basket. I don't need to dig through it to see what is on the bottom. 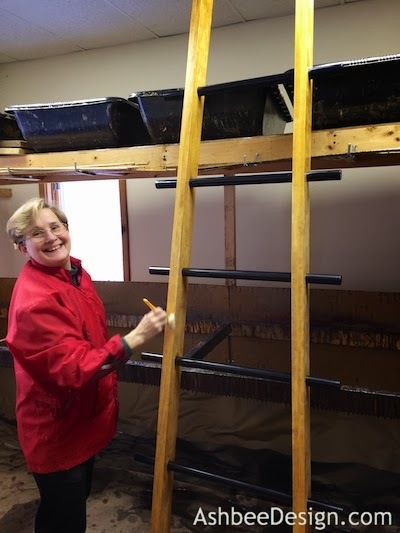 I constructed the ladder so that the rungs extend 4.25" on each side providing extra quick storage for bags or a drying place for wet gloves. The plan going forward is to create some funky hooks along the left wall for coats and hats. I have saved some ideas in my Pinterest boards. I can then relocate the beautiful handcrafted coat tree (located in the back left) and add a more functional hanging solution to this tiny, yet so necessary a space. The closet to the right is our coat closet but there is also extensive storage in there for the assorted specialty hats and gloves that only get used for special occasions - like all the blaze orange hats we need to wear during hunting season! Snow has been a major factor in many parts of the USA this winter season, not just the northeast. Others of you might be interested in building one of these yourselves. Here are a few of the basic steps I followed. It is a general tutorial not a specific one. The entire project was based around the baskets. 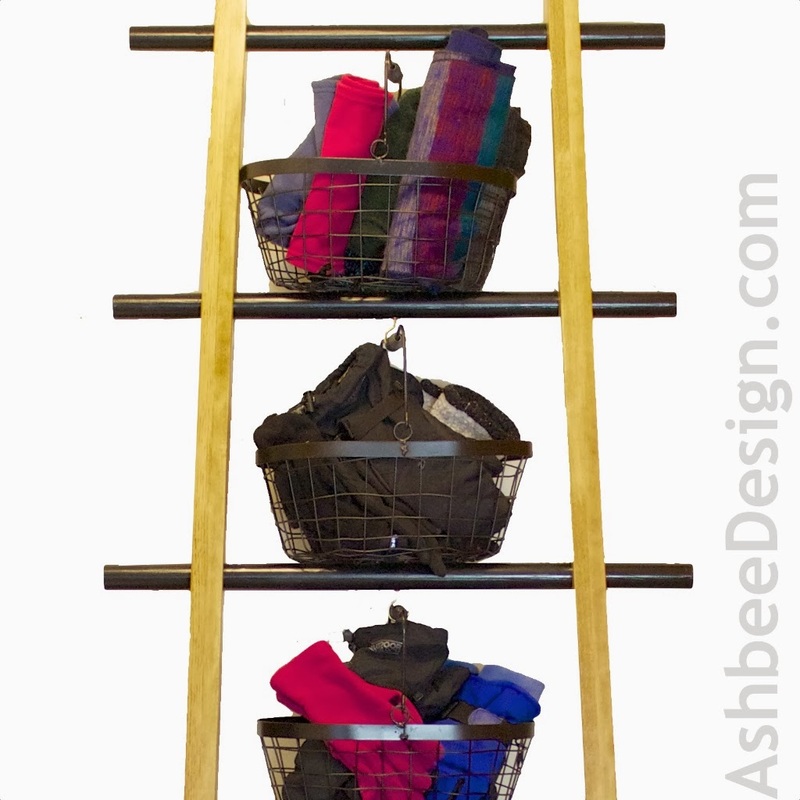 If you decide to try it, your ladder will need to based off your baskets so buy the baskets first! 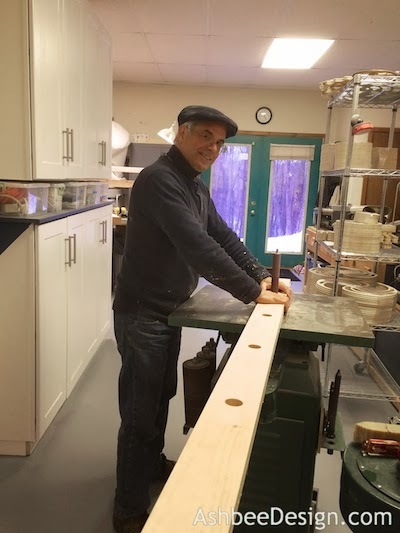 5 piece wooden closet pole ranging 25" to 30"
Glue the pine boards together in pairs. I wanted the side rails to have some visual heft so each is made of two pine boards glued together. 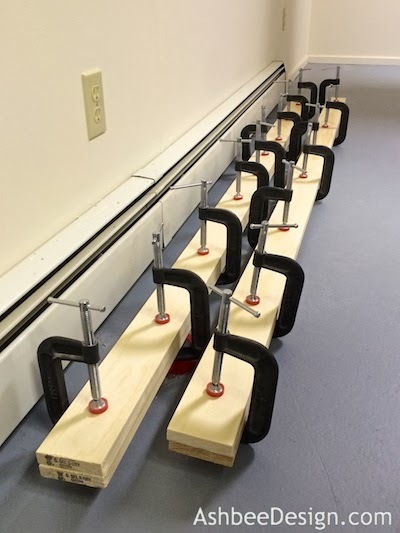 I used Titebond wood glue and clamped them while they dried. Layout the spacing of your rungs. 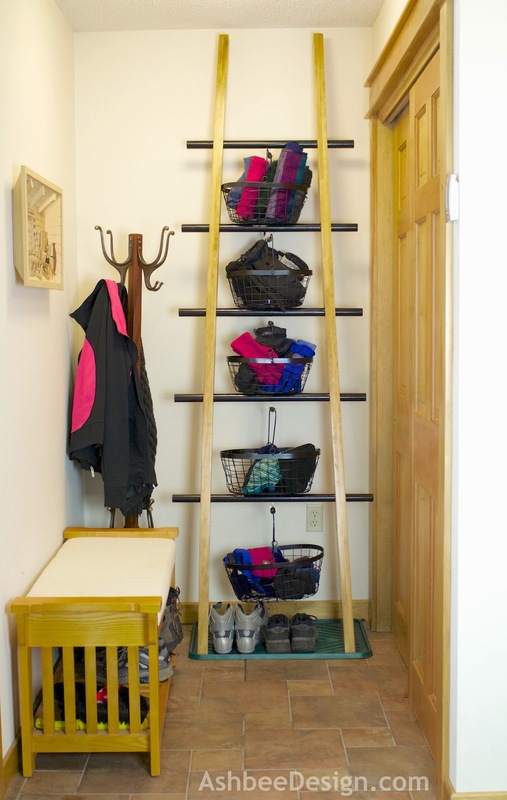 This step is a combination of personal preference and the size of your baskets. I have 2 larger and 3 smaller baskets so I wanted my side rails to lean in. I also wanted my rungs to be as close together as possible. That way the top most basket would still be within reach. 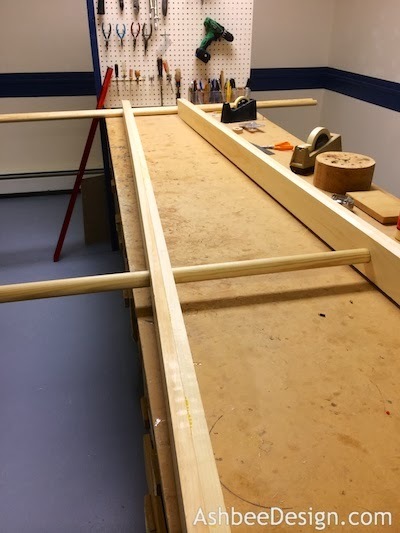 I laid everything out on the workbench and carefully measured the spacing. The rungs are not equally spaced because my baskets are different sizes. You will need to space yours according to your baskets. 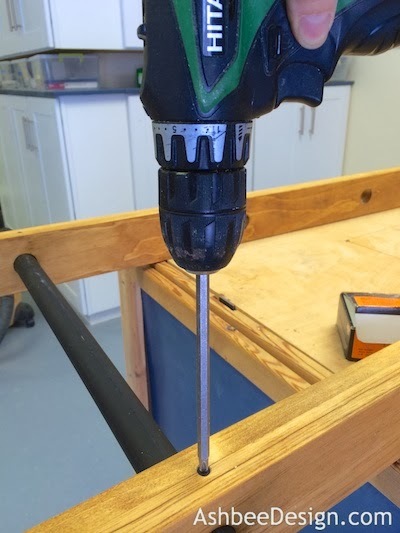 Using a drill press and a large bit we drilled holes in the side rails for the rungs. 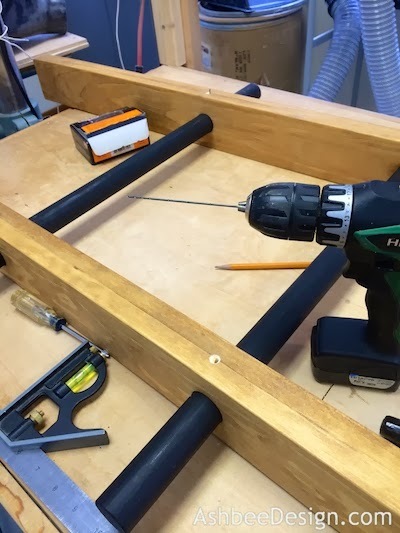 Because I wanted the side rails to angle in, the holes needed to be drilled at and angle of 2.5º. David helped with several steps including this one because it takes two to both drill the holes and hold the long boards in place. Turn's out I should have purchased a bit larger than the 1 1/4" diameter of the closet pole. The fit was too tight and we needed to sand them out larger. Because I was planning to screw the rungs in place it was fine to have a lose fit. I assembled the ladder and labeled everything. At this point the rungs were individually fitted to each hole. I decided I wanted the rungs to extend 4.25" outside of the rails. 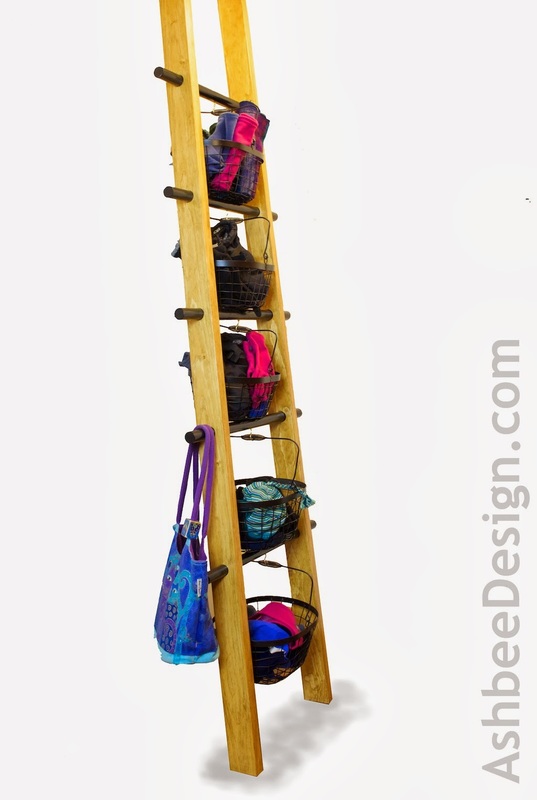 I like that design element in the ladder plus it provides the extra hooks for hat/bag hanging. 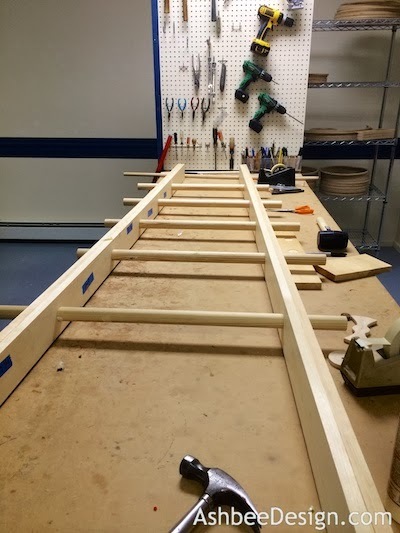 Once I had everything fitting, I cut all the rungs using a miter saw which I forgot to photograph. I didn't worry about the edges from gluing two boards together until this point and then I used a belt sander to even those edges out. The ladder is together but not permanently assembled here. I sanded all the parts using an orbital sander. I went through several grits of sand paper from 80 to 150 and finished up with 220. I finished the side rails and the rungs separately. 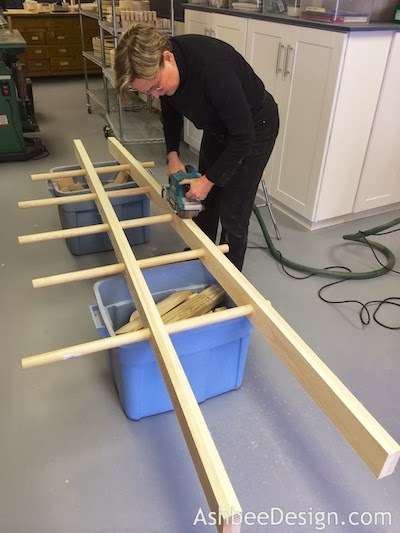 The rails got one coat of MinWax Puritan Pine stain. That matches the woodwork in my family room. 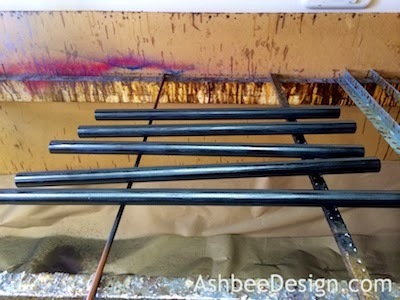 I used flat black spray paint to paint all the rungs. I didn't want a paint build up on them because I wanted them to easily slide into the holes. 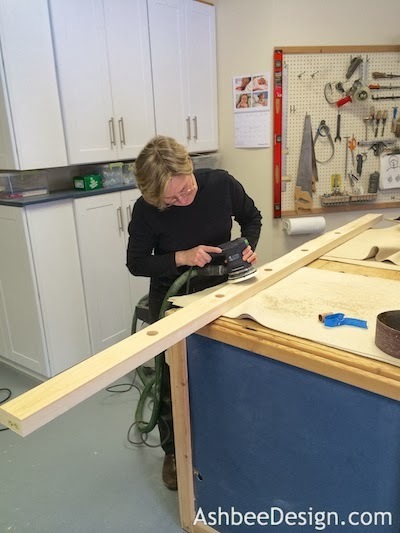 Once everything was dry, I positioned the rungs, making sure everything fit together. I then drilled a pilot hole through the back of the rail and into the rung. And each rung was screwed in place. 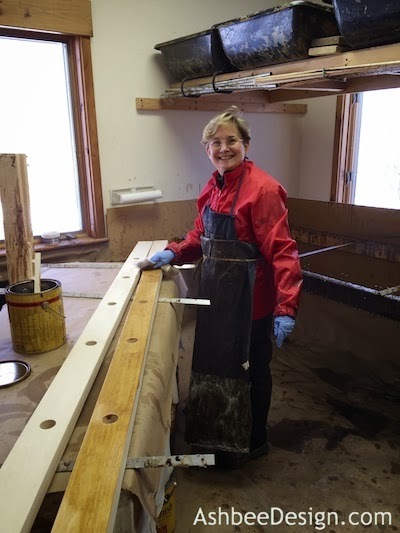 Once the ladder was completely assembled, I applied 2 coats of polyurethane with a light sanding in between coats. Once dry, it is all set for the baskets to be placed and to sort the mittens and hats and put them in their new homes. Now let's see if this will be a solution to the Mitten Dilemma! This is very pretty! I like the simplicity of it. It's funny how it takes so long to finally get around to doing things! Yes, delay and stall are my two middle names this year! And it works. We are picking up our mittens and hats and putting them away! This is SOOOOOO cute! Great idea. Thanks Taryn. And functional. I love organizing projects that add to decor and work! Anything to calm the clutter.